Cauliflower Tacos – The crispiest cauliflower you’ve ever had…and it’s BAKED! Crispy, crunchy, creamy – you can have it all with these Crispy Coconut Lime Baked Cauliflower Tacos! I have to admit I haven’t been this excited about a recipe in a long time! These seriously turned out better than I could have ever imagined and now I can’t stop eating them. They are the perfect light summer meal! Easy with super fresh flavors, this recipe hits on all the best textures – crispy, crunchy and creamy. 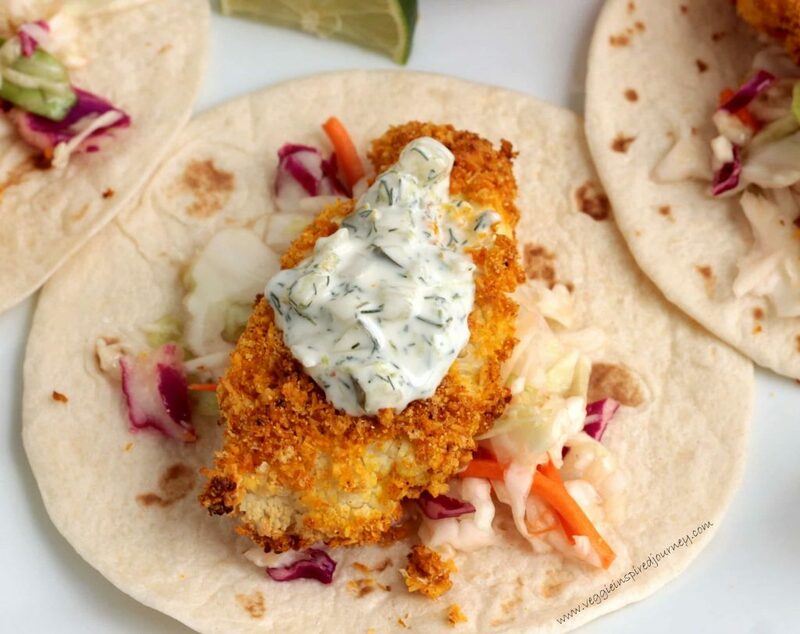 You have to try these Crispy Coconut Lime Baked Cauliflower Tacos! 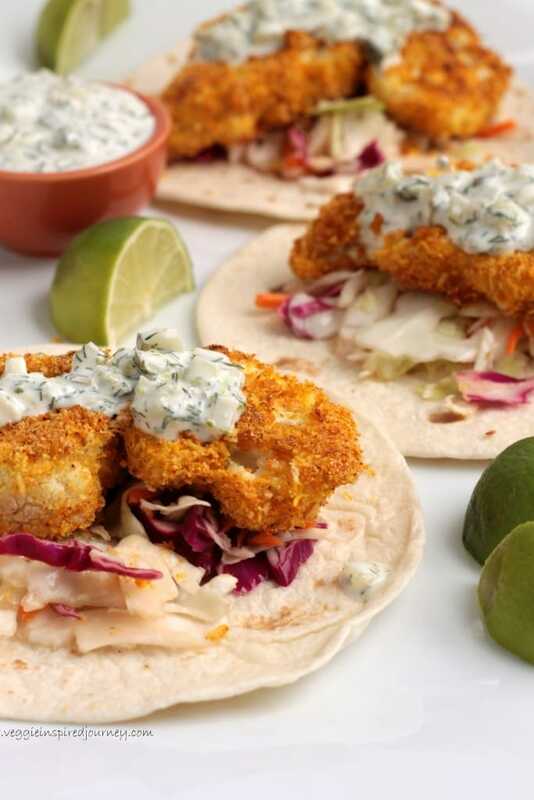 The crispy cauliflower, the crunchy coleslaw, the creamy tartar sauce – it all works so perfectly together to create one delicious bite! 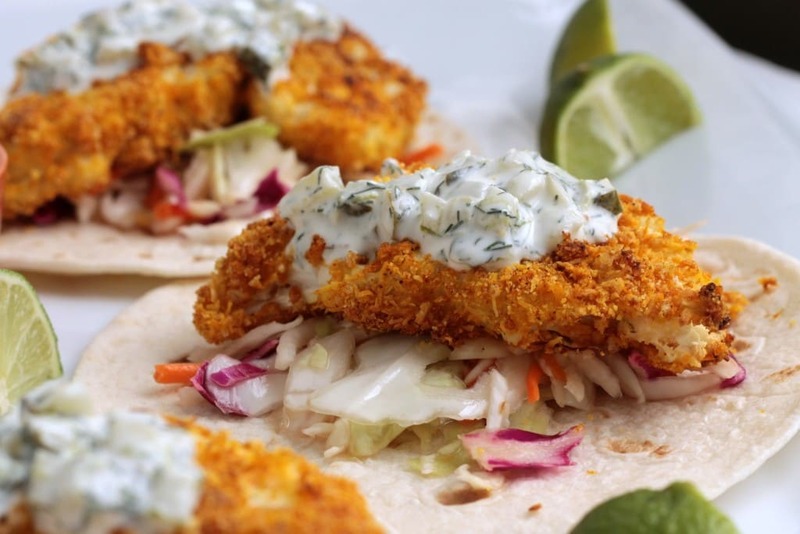 Reminiscent of a fried fish taco, it’ll have you dreaming of the waves breaking on the sand while you dine seaside. Perhaps a Pineapple Coconut Smoothie, which tastes like a virgin piña colada, would be a great choice to wash it down. I can easily take down three of these Cauliflower Tacos in one sitting – sometimes more! It’s so hard to stop! And the whole family loves them too! I am not even kidding when I say this cauliflower is the CRISPIEST you’ve ever had! The panko breadcrumbs and coconut flakes combine to make a super crunchy crust surrounding the cauliflower. The cauliflower, on the inside, is tender and delicious! With absolutely no oil, it’s BAKED, not fried. I almost couldn’t believe it myself. I have made these cauliflower tacos a huge number of times now because I wanted to make sure it wasn’t just a fluke and that it would turn out super crispy when you guys make it too. I promise, it will! Just look at all that crispy breading! 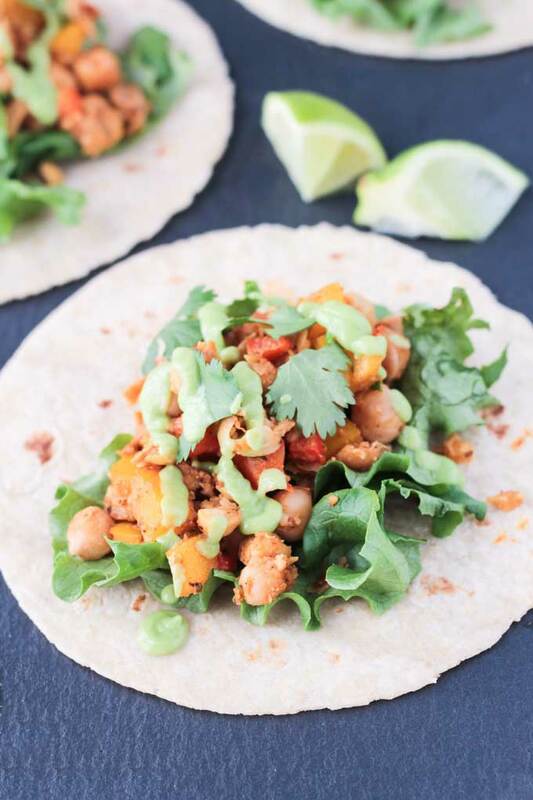 These are just like your favorite crispy fish tacos, but so much better because they are plant based, healthy cauliflower tacos! These do take a little bit of time to prep, but trust me, it’s worth it! 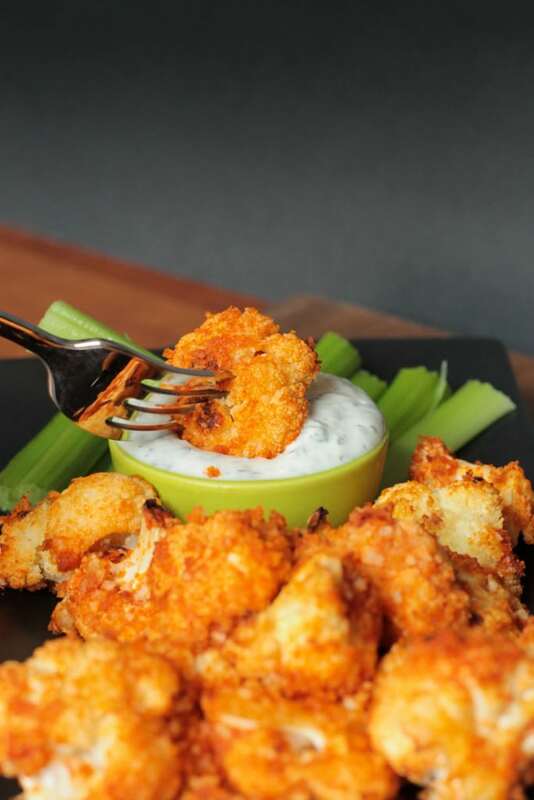 Feel free to skip the tortilla, dip the baked cauliflower right into the tartar sauce and pop it right into your mouth. De-lish! Serve the coleslaw on the side. Tip – bagged coleslaw works just as well here and would be a nice time saver. I hope you guys love these Cauliflower Tacos as much as we do! You need to RUN, not walk, to the kitchen to make these ASAP! If you do make them, please come back here and leave me a comment below with your feedback and star rating. I love hearing from you guys! You can also find me on social media. Be sure to tag @veggie_inspired and #veggieinspired so I’m sure to see it. Enjoy! The crispiest vegan tacos you've ever had! The combination of flavors and textures from the crispy baked cauliflower, the sweet and sour crunchy slaw and the creamy tangy tartar sauce are out of this world! ~I like my cauliflower pieces to be long and fairly thin for this recipe, not your traditional floret style. To do this, I place the head of cauliflower on my cutting board stem side down and cut in half from top to bottom. Cut the bottom of the stem off. Stand one half upright on your cutting board and make thin slices from top to bottom. Take one of the large thin slices and place it on the cutting board. Cut any remaining stem off if you wish...I like to leave a little bit to help hold it together. If it's too long, cut it in half again. Repeat with the remaining cauliflower. Of course, if you like chunkier florets, that will work just as well. ~Nutrition facts calculated for baked cauliflower, tartar sauce, and slaw. This does not include tortillas. Made this last night. The cauliflower was ah-mazing! I loved the play between the coconut, lime, and spices. I didn’t follow the exact recipe for the slaw & tartar sauce and they turned out so-so. That, however, is totally my fault. 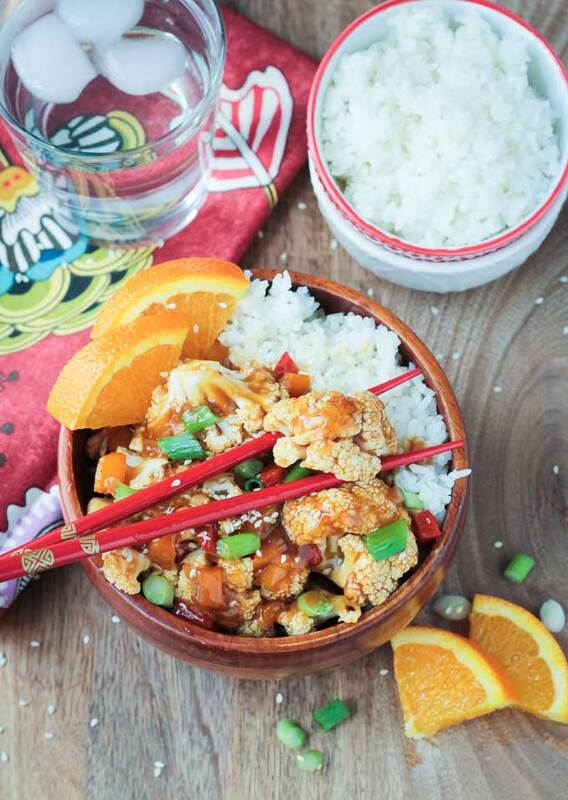 Will definitely try the whole thing again but can also see many ways to use the cauliflower. So glad you love them, Lisa! Thank you! Wow, this was delicious! The only change I made was to use guacamole instead of the tartar sauce. The cauliflower would even be amazing on its own. Thank you, Natasha! So glad you loved it. And guacamole can never be wrong! Yum! This may be my favorite vegan recipe I’ve ever made, and I’ve been cooking mostly plant based for a number of years now. So so good! I will definitely be making these again and again. 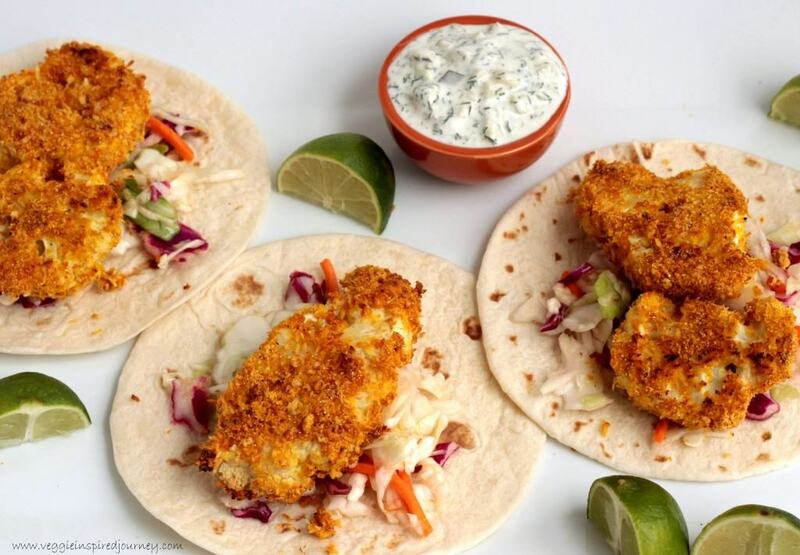 Don’t even make me miss fish tacos they’re so amazing! That’s so great to hear, Brynn! So happy you love them. Thank you for your comment! Hello! I have not tried this yet, but it looks AMAZING- just curious what is making the sodium content so high? Thank you! Hi, Erica. It was wrong! I use MyFitnessPal to calculate and their default salt option isn’t correct. Some of my old posts – before I figured out it was wrong – may have incorrect sodium. I just fixed it! Thanks for pointing that out. Hope you enjoy them!